After being crowned the NBA's Most Valuable Player, Oklahoma City Thunder's Kevin Durant gave his mom the best Mother's Day gift of all. In his acceptance speech, Durant thanked his mom Wanda Pratt saying, in part: "We weren't supposed to be here. You made us believe. You kept us off the street, put clothes on our backs, food on the table ... You sacrificed for us, you're the real MVP." On "New Day" Thursday, Pratt said she didn't focus on herself while her two boys were growing up. "It was their lives I was really pushing for," she said. Pratt said she would hide her tears and sometimes cry at night, but Durant sacrificed too. "He’s worked so hard," she said. "He didn’t hang out with friends from age 8 or 9 till age 16 – he was always working on his game of basketball. " 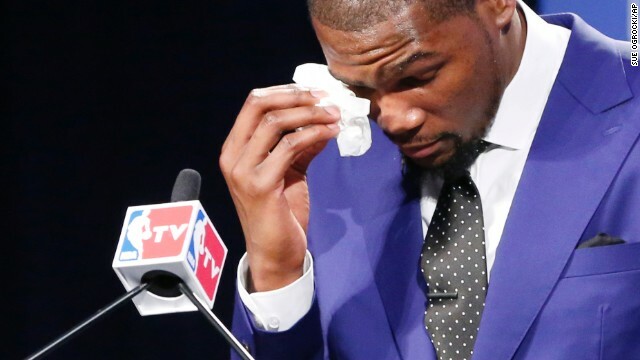 Mom said she's grateful to be able to see Durant be rewarded for all that hard work.